What are FRoGs and what do they do? FRoGs stand for Friends of Greytown School. Help at special events eg: Pet Day, Athletics Days, Space and Science Festival etc. raise money to provide some “extras” around the school or help specific school groups eg: supporting the Chess club to go to Nationals. At Greytown School, we do not have a specific night where we meet as a group as we understand that people can help in different ways and at different times. a longer term or “bigger” project. Currently, we have a team of FRoGs working on raising money for a new school BIKE TRACK. We have wonderful, hard-working parents, whānau and teachers who have raised money from sausage sizzles, auctions, summer music concerts, and other fun school community events. children to attend special trips eg: Chess Club attending Nationals, School Leaders attending New Zealand Young Leaders Conference etc. turning an old storage area into an additional learning space. Robotics equipment for our STEAM programme. plants for the school and enviro groups gardens. updating our lost property area to give our Reading Recovery Room more space. 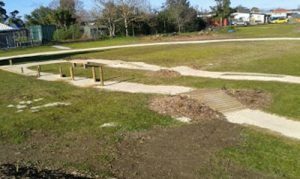 ….and currently, we are working on a new bike track that children have been designing! We are always keen for ideas and help in up-coming events. You can make a big difference even by offering to help in a one-off event, but if you can offer more that’s great! Popping into the office to put your name down. From here we will pass your details on to Rachel Gawith (FRoGs coordinator) and/or Ali Morgan (staff FRoGs member). Rachel and her team will then send out emails or ring you to see if you are available to help at different times…and if you are able to great!